Multiple power (AC90-264V) input for world wide factory use; easy transfer to overseas facilities. The Terra controller has been designed to be integrated with any external robot. Soldering and soldering parameters can be entered from any keypad. Because this touch screen like the following error also can check the status of the device intuitively. Program to soldering (soldering) is 99 point type, slide 99 species, 297 species it is possible to store a total of 99 species of special solder. Operation by touch alone, but also makes it easy to cooperate with IO signals robot and turntables. You can also easily synchronize multiple units also during operation. RSP soldering iron units for points or the RSL for the soldering iron sliding unit. Tube feeding solder wire and solder feeder to send, it also comes with one soldering iron, soldering all devices are aligned with one TERRA. 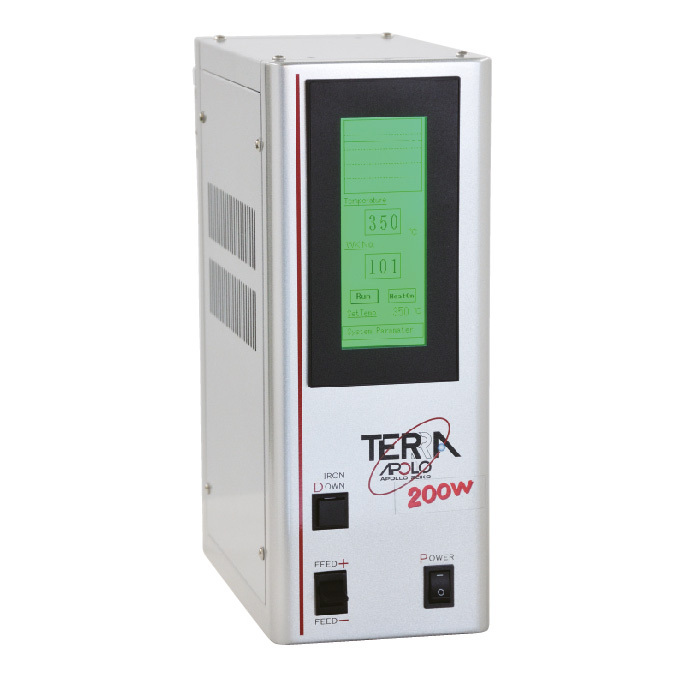 The multi-power supply is built into TERRA, power is supplied to the control of the apparatus and a soldering iron can be used in areas without trans AC220V.